Several plants exist with a look or characteristics similar to those of the aloe plant. Many of these are part of a loose grouping of plants called succulents--named for their appearance and shared traits, rather than as a botanical classification, according to the University of Illinois Extension. Some share aloe’s general shape, some its spiky leaves and spines, while others have a similarly thick, moisture-filled foliage. Yucca ranges in form from a plant to a thick-stemmed tree. 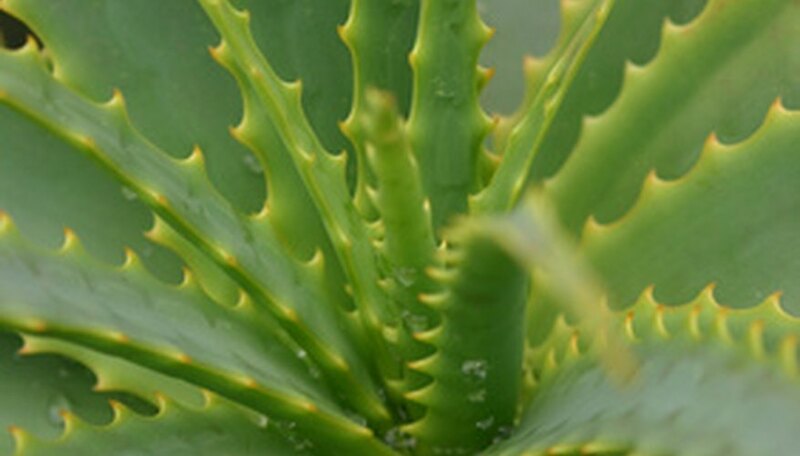 The Adam’s Needle variety may bear closer resemblance to aloe vera because of its single mound of sword-shaped leaves. The foliage is a deep green or variegated and the tips can be spiny and sharp. Yucca blooms yearly, sending up a center stalk that reaches up to 6 feet in height and becomes filled with bell-shaped, waxy white flowers. Later, the stalk is covered in peanut-shaped, dark brown seed pods. Agave is popularly known as the source of a sweetener and honey alternative. Agave Americana--also known as the “century plant”--has leaves with a very similar shape to those of aloe. The leaves grow to up to 6 feet long and they are lined with serrated teeth. The plant can have a bluish green color or green and yellow variegated leaves. Agave produces an extremely tall flower spike--sometimes reaching 20 feet--which heralds the death of the plant to follow. Agave is usually found only in the southernmost regions of the U.S.--areas like Florida, portions of Texas and Louisiana and the California coast. While aloe is known for the gelatinous liquid within its leaves which is often used to treat skin issues, the agave plant can produce a caustic liquid that has the potential to burn and blister skin. The spines of the plant are dangerous for incidental contact. Succulents in general resemble aloe vera through the shared trait of fleshy leaves. The University of Minnesota Extension lists kalanchoe and ground-hugging hen and chicks among the many varieties of succulents. The list also includes jade plants, which bear fleshy lobes in place of the sword-shaped leaves. Succulents, aloe included, serve well as houseplants, requiring little care and suffering from few or no pests or disease issues. The plants usually need only a good source of light and careful neglect--meaning sparse watering during their dormant period and fertilizing only during active growth periods. Group several succulents together for a unique display of height, foliage variation and color.